Atlantic County’s population declined 0.1 percent from 2010 to 2015, dropping from 274,549 to 274,219. Close to a third (33 percent) of Atlantic County’s registered voters are Democrats, 25 percent are Republicans and 42 percent are Unaffiliated. In both 2012 and 2016, Atlantic County’s voter turnout (66 and 68 percent) was lower than New Jersey (67 and 69 percent). The 2016 voter turnout in Atlantic County and South Jersey was 68 percent. Atlantic County’s unemployment rate has seen a steady decline between 2014 and 2016, going from 10.5 percent to 7.1. Comparably, the downward trend in unemployment rates matches that of the region (8.0 to 4.9 percent), New Jersey (6.7 to 4.1 percent), and the nation (6.2 to 4.9 percent). Atlantic County’s unemployment rate was notably higher than the regions and New Jersey’s from 2014 to 2016. The poverty rate in Atlantic County has dropped from 18.0 percent in 2013 to 14.3 percent in 2015. Despite the improvement, it has remained in the double digits over the aforementioned time period, and has far outpaced the region and state’s poverty rates. The region (12.1 to 11.0 percent), and the state (11.4 to 10.8 percent) both had decreases in their poverty rate from 2013 to 2015. The median household income in Atlantic County has increased between 2013 and 2015. Atlantic County’s median household income in 2013 was $52,127 and increased to $55,313 in 2014, but decreased slightly in 2015 ($54,052). Atlantic County’s median household income was well below New Jersey and the regions from 2013 to 2015. New Jersey’s median household income from 2013 to 2015 was $70,165, $71.919, and $72,222. The average median household income in South Jersey counties from 2013 to 2015 was $60,949, $62,689 in 2014, and $64,059. Nonviolent crime rates in Atlantic County decreased from 36.7 to 29.5 from 2010 to 2014. In addition, there were decreases in the violent crime rate (5.7 to 3.9) and total crime rate (42.4 to 33.4). Atlantic County’s crime rates far outpaced New Jersey’s in 2014. New Jersey’s crime rates in 2014 were: nonviolent rate of 17.0; violent rate of 3.0; and total crime rate of 20.0. 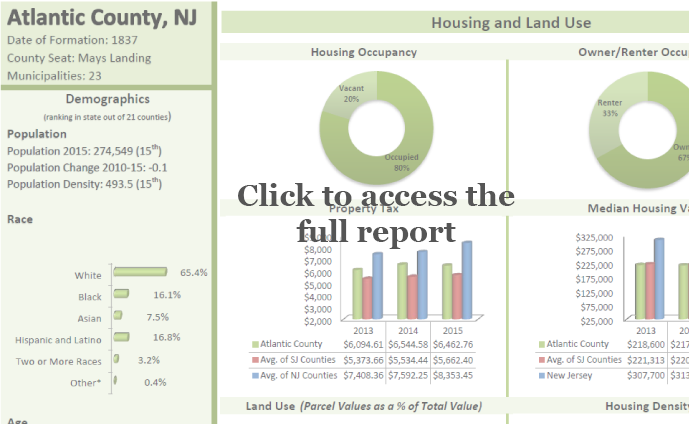 In 2015, Atlantic County had a slightly lower residential parcel value as a percentage of total value of parcels than the average New Jersey county (71.4 and 76.9 percent respectively). Conversely, Atlantic (24.7 percent) had a high percentage of non-residential parcel value than the average New Jersey county (4.2 percent) as well as commercial parcel value (22.5 and 13.5 percent respectively). In 2015, over half of the homeowners (50.3 percent) in Atlantic County lived in housing that was unaffordable, higher than the region (40.1 percent) and state (43.6 percent). The percentage of renters who paid 30 percent or more of their income on housing cost was 60.7 percent, higher than the region (55.8 percent) and the state (53.9 percent). As of April 2016, the foreclosure rate in Atlantic County was 3.4 percent, higher than both the region (2.7 percent) and the state (2.5 percent). The median housing value in Atlantic County was $218,600 in 2013, and dropped to $217,000 the next year before increasing to $223,400 in 2015. The average housing value in South Jersey counties saw similar trends. In 2013 the average median housing value of South Jersey counties was $221,313 and dropped to $220,463 the next year before increasing to $225,725 in 2015. The median housing value in New Jersey increased every year between 2013 and 2015 and is much higher than both Atlantic County and the South Jersey region ($307,700, $313,200, and $322,600). The average property tax paid in Atlantic County was $6,094.61 in 2013, rising to $6,544.58 in 2014, and slightly falling to 6,462.76 in 2015. The average property tax paid in the South Jersey region increased every year between 2013 and 2015 ($5,373.66, $5,534.44, and $5,662.40). The average paid in New Jersey in 2013 was $7,408.36, and increased to $7,592.25 in 2014 and $8,353.45 in 2015. Atlantic County has an 80 percent occupancy rate with 67 percent of its unit’s owner-occupied and 33 percent renter-occupied. In both 2015 and 2016, Atlantic County ranked 18th among New Jersey counties in child poverty rate. The county dropped one spot in percentage of births to girls 10 to 19 (19th to 20th), and infant mortality rates (20th to 21st), while improving its ranking in juvenile arrest rate from 16th to 15th. The county’s overall Kids Count rankings in 2013 was 19th, climbing by one in 2014, and has been ranked 20th since 2014. In the category of Health Outcomes (based on variables used to determine length and quality of life), Atlantic County was ranked 19th in 2014, dropped one position in 2015, before climbing to 18th in 2016. In the category of Health Factors (based on variables used to determine health behaviors, clinical care, social and economic factors, and physical environment), Atlantic County was ranked 19th in 2014, dropped to 20th in 2015 before returning to its 2014 ranking in 2016. In the category of Social and Economic Factors (based on high school graduation, some college, unemployment, children in poverty, income inequality, children in single-parent households, social association, violent crime, and injury deaths), Atlantic County was ranked 19th in 2014, dropped to 20th in 2015 and 2016. Page last updated by Senator Walter Rand Institute for Public Affairs at 2:32 pm March 28, 2017 . This page was printed from http://rand.camden.rutgers.edu/publications/southern-nj/atlantic-county/ at 4:26 PM Monday, April 22, 2019.